PULLMAN, Wash. – With finals week looming for Washington State University students, many will receive comfort from animals to help cope with stress. 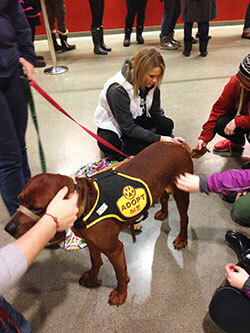 Dogs from the Whitman County Humane Society will visit 11 a.m.-1 p.m. Wednesday, April 30, in the CUB Butch’s Den. The opportunity to “pet stress away” has become a tradition of interaction with animals that students enjoy, said Ray Acuña-Luna, WSU residential education director and event co-organizer. The activity is arranged by the Office of the Dean of Students. Representatives from WSU’s wellbeing program will be on hand to share stress-management resources. Since there are typically many more people who want to pet the animals than there are dogs, people are asked to wait on the CUB’s ground level – at the top of the stairs that lead down to Butch’s Den on lower level 1. This is to keep the entrance to Butch’s Den clear in case of an emergency. The meeting location will be clearly marked and people will be escorted down to the animals as space becomes available.